Simplistic yet effortless, this BY JOHNNY mini is a stylish addition to any wardrobe. Scooping low and straight in the neck, with bold thick straps, the mini sits firm on the body until it falls at the hips into a godet styled skirt. 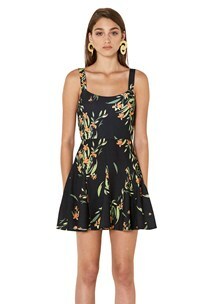 The dress is canvased in a custom BY JOHNNY hand-painted print made from a medium-weight crepe. At the back is a metal zip for access. By placing your order before 2:00pm AEST you will get your online order on the next working business day via Australia Post’s Express service. Please note that if you live in certain regional areas there will be exceptions to this delivery time frame. It all depends on whether you live within or outside the general post express network. Please allow between 5-10 business days to receive your parcel from the time you place your online order. For all international purchases, we will use TNT to ship your parcel. We will follow up your order with a courtesy email asking for confirmation of your delivery address, once this has been confirmed with our online department, we will send you a tracking number so you can view the delivery progress. If you have purchased the wrong size and would like to exchange it for another size, please contact us at info@byjohnny.com.au within 7 days from the date of purchase and you will be sent an email containing a Return Authorisation number and instructions on returning the garment. Once the product is received and has undergone a quality control check to ensure the product has not been worn and that the tags are still in place, the new size will be dispatched. Please note that customers will not be charged additional delivery fees for the exchange. If you receive a faulty product, please notify info@byjohnny.com.au immediately and the item will be exchanged for you. Please note that returned goods will not be accepted without a Returns Authorisation number. If you would like to return your purchase, please contact us at info@byjohnny.com.au within 7 days of receiving your purchase and you will be sent an email containing a Returns Authorisation number and instructions on returning the garment. Once the customer has been sent a Returns Authorisation number, the item must be sent back within the 7 days to be eligible for a refund. Any items returned after the 7 days will receive credit only. Once the product is received and has undergone a quality control check to ensure the product has not been worn and that the tags are still in place, the purchasing amount less delivery costs will be credited to the purchaser’s credit card or account. Refunds will be made within 14 days of the cancellation notice. We strongly advise customers to thoroughly check the product and try it on when it is received to ensure you are satisfied with the products. Refunds and exchanges will not be permitted after 7 days from the date of purchase. Please note that refunds will not be accepted without a Returns Authorisation number. Wonderful! The Gift Voucher has been added to your bag. Looking for a gift for someone special but not sure what to give them? 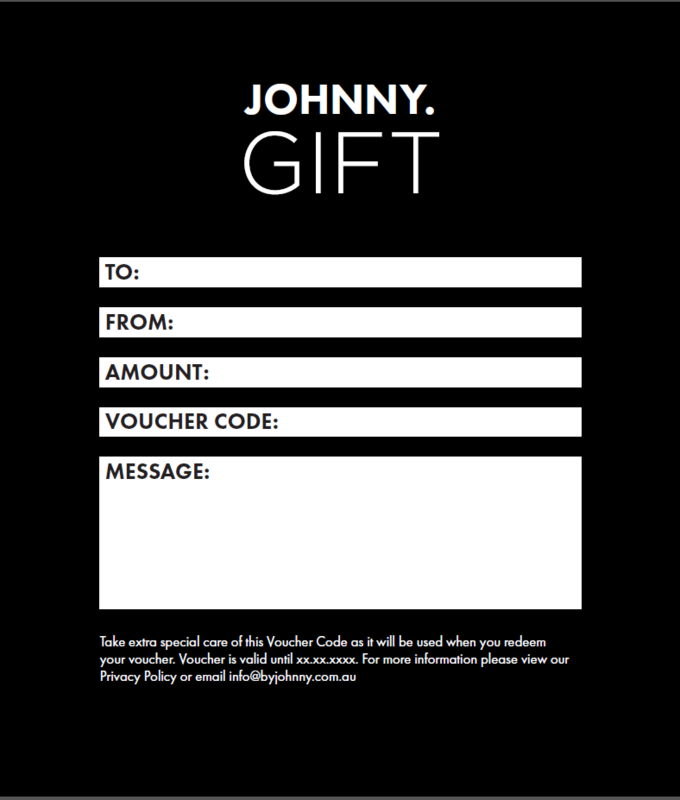 Give them the gift of choice with a BY JOHNNY gift voucher. 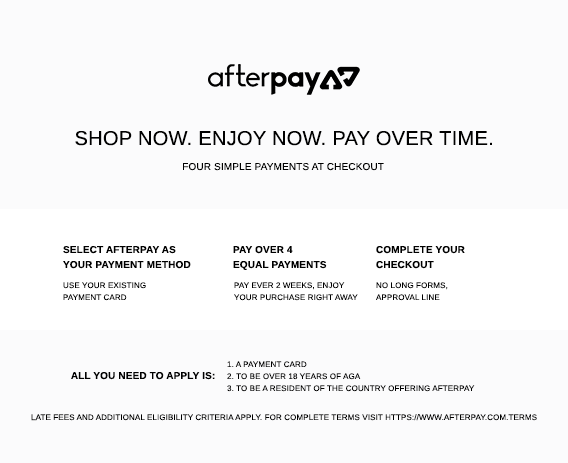 Gift cards are delivered by post and will contain instructions on how to redeem them at checkout. Please be sure to enter the correct postal address for the receiver when purchasing. Maximum of 100 characters remaining. you when we have more sizes Your enquiry has been sent. Send your friend this look via email. You have shared this style to your friend. SIGN UP FOR EXCLUSIVE UPDATES AND MORE FROM BY JOHNNY. Thank you for subscribing email.